My grandmother, Bridget "Sis" Maloney, and her younger brother, Tom, at Indian Point, NY. Taken on May 31, 1925. 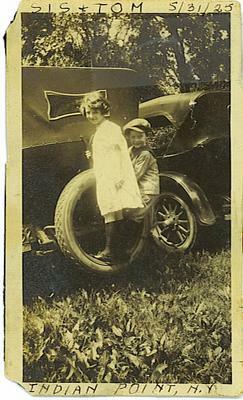 My Nana passed away a few years ago and the family is in the midst of packing and unpacking and going through photos. The Story: Sis & Tom's older brother, Johnny, had been hit and killed by a taxicab in front of their NYC apartment on May 10. Johnny was 10. Relatives took the children away from the city to the country for a few weeks.